Framed by the Earth's horizon and airglow, the full moon floats in the blackness of space in this photo from the Expedition 10 crew on board the International Space Station. Each Friday this summer, Life's Little Mysteries a sister site to SPACE.com, presents The Greatest Mysteries of the Cosmos, starting with our solar system. Although it is the closest celestial body to us, the moon still harbors secrets aplenty. "Closest," of course, is a relative term: The great gray and white orb in our sky never veers much nearer than 225,000 miles (362,000 kilometers), and getting there is no easy feat, especially in the case of manned missions. No human has left boot prints in the lunar regolith since 1972. Yet over that nearly four-decade absence, nations around the world have dispatched a number of probes and conducted gobs of research on our only natural satellite. Meanwhile, lunar rocks originally ferried back by the Apollo program decades ago are still offering up vital clues about the history of the moon. Cultures worldwide have long offered up myths to explain the moon's existence. Nowadays scientists have other ideas of what really happened. This picture has problems, however. The theoretical impactor, dubbed Theia, should have left residue with distinctive characteristics, but they have not been detected. And the amount of certain substances in the moon – too much water (frozen), for example – does not readily mesh with a hot, cataclysmic origin scenario. Indeed, it is the presence of a great deal more water in and on the moon than expected that has really thrown researchers for a loop. "The more astronomers look, the more we find water in different places and depths," said Neil Comins, a professor of physics at the University of Maine. Water ice has turned up in craters near the poles, particularly in a plume kicked up by the deliberate impact of NASA's LCROSS probe in 2009. Studies have suggested the interior of the moon is far wetter than ever supposed (though still hyper-arid compared with modern-day Earth). Recent re-examinations of the rock samples brought back to Earth by astronauts have even yielded signs of agua. Icy comets likely delivered a substantial portion of this water when they smashed into the moon, but scientists are still scratching their heads. "It's really an open question about the origin and distribution of water on the moon," Comins said. 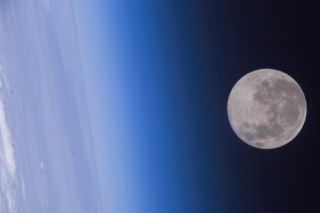 The moon is "tidally locked" to Earth, meaning only one hemisphere faces us. We know that side well, with its dark regions called maria, or "seas," of cooled magma. Oddly, however, these maria are virtually absent from the back side of the moon, as has been revealed to us by probes (and seen in person by Apollo 8 astronauts). The proverbial "dark side of the moon" also is much more pockmarked by craters. The starkly different hemispheres have been partly explained by the far side having a thicker crust — perhaps by 9 miles (15 km) or so — than the near side. "This made it easier for the crust on our side to have cracked" under the onslaught of meteorites, which released maria-forming magma from deeper in the moon, said Comins. But that crustal asymmetry is an enigma itself. The extra cratering, meanwhile, could stem from greater exposure to space on the far side than on the Earth-shielded near side. A greater modeling of the moon's interior and a better understanding of the damage wrought by impacting bodies might help explain this strange two-facedness. Bonus boggler: Key to our existence? At a quarter of the diameter and more than 1 percent of Earth's mass, our moon is a hefty one: the fifth largest natural satellite in the solar system, and the biggest compared with its host body. In short, astronomers have wondered if Earthlike worlds need large moons like ours in order for life to develop. An answer might be waiting for us next door, so to speak – on Mars. The Red Planet sports two measly, little moons, thought to be captured asteroids. Should Martian life ever be found – unlikely, but not out of the question – that would aid in squashing the moon-assisted habitability debate. "When we go to Mars and determine if and how far life evolved there," Comins said, "that will help us better understand how life could have formed here without the moon." This story was provided by Life's Little Mysteries, a sister site to SPACE.com. Follow Life's Little Mysteries on Twitter @llmysteries, then join us on Facebook.